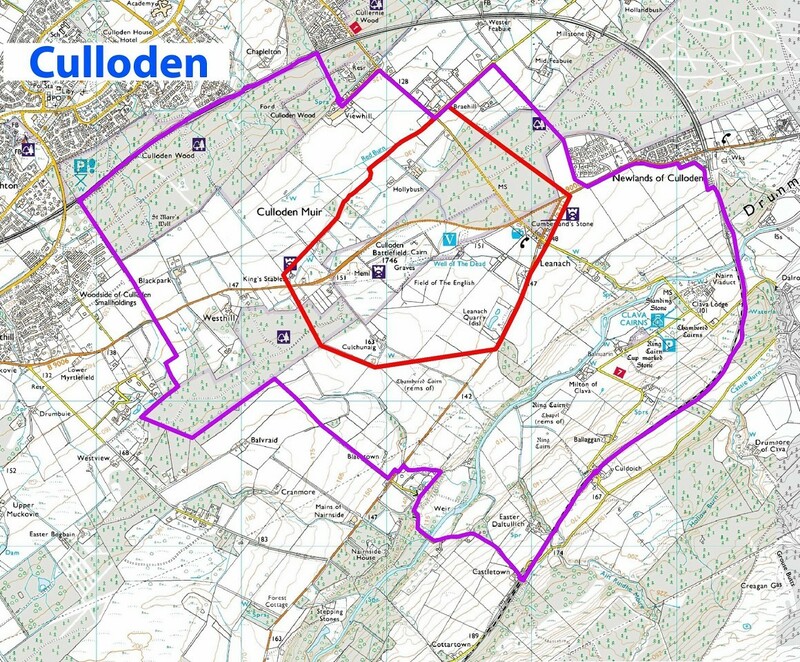 A rough map of the Culloden battlefield site with a blue marker showing the current conservation line. 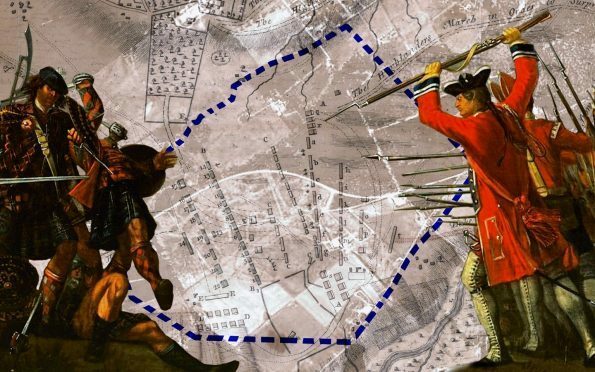 Councillors are poised to back plans for an exclusion zone five times the size of the buffer currently protecting historic Culloden Battlefield from developers. The move would signal a massive victory for campaigners fighting to safeguard the history-steeped site. There was a global furore after the Scottish Government granted permission for a 16-house scheme close to the site of the last battle fought on British soil. But now a 2,423-acre exclusion zone is likely to replace the existing 536-acre one. Last night, campaigners welcomed their impending victory. Local SNP councillor Ken Gowans said: “I’m very happy. It’s been a long time coming and needed. It’s incumbent on us as a council to protect one of the nation’s most valuable assets. He said a new boundary could not guarantee a complete ban on development, but would halt any “large scale” projects for the “foreseeable future”. The 1746 battle, the last to be fought on the British mainland, ended with the army of Prince Charles Edward Stuart being crushed by the Duke of Cumberland’s government forces. It lasted barely an hour – but claimed more than 1,000 lives. Permission was granted last year for a 16-home development close to the battlefield, near Inverness. Angry protests followed both at the site and outside the Scottish Parliament after a Scottish Government reporter overruled the local authority and gave planning consent. Opponents even considered mounting a legal challenge against local landowner David Sutherland’s house building proposal. Although permission was granted, none of the homes has been built. However, it is understood an announcement regarding the development site is imminent. The conservation area is being reviewed along with all others in Highland and will be discussed members of the council’s city committee. Award-winning US writer Diana Gabaldon, whose Outlander series of novels has won plaudits from millions of fans around the world, had added her weight to the campaign against plans for the homes at Viewhill, Balloch. Terry Levinthal, conservation director at the National Trust for Scotland, the battlefield’s guardian, described the extended boundary plan as “very welcome news”. He said: “This approach sensibly aligns the boundaries of the conservation area with what’s included in the inventory of historic battlefields, enabling much easier management and increased protection of the area for years to come. The business community has given a cautious welcome to the proposed widening of the conservation area. Inverness Chamber of Commerce chief executive, Stewart Nicol, said: “It needs balance. The battlefield is a national asset and tourist attraction that must be protected. “However, regarding some of the developments proposed and some of the reaction to them I don’t think there’s been an appropriate perspective on things. It’s a case of ensuring the protection of the asset doesn’t stop appropriate development. “If there is available land for development that doesn’t impact on the battlefield there shouldn’t be a problem. Fraser Grieve, of the Scottish Council for Development and Industry, said: “The east of Inverness is hugely important for the development of the city and it’s important to strike a balance preserving Culloden’s heritage while ensuring the growth of Inverness can continue to move out to the east of the city.